La Traviata’s sumptuous melodies and timeless depiction of doomed love have made the work a favorite of generations of operagoers. In his approach to this classic drama, director Willy Decker sets the action on a nearly bare stage, focusing the audience’s full attention on the three main characters. As Violetta, the ailing courtesan desperate to escape her past, soprano Sonya Yoncheva offers a fearless and sympathetic performance from beginning to end. 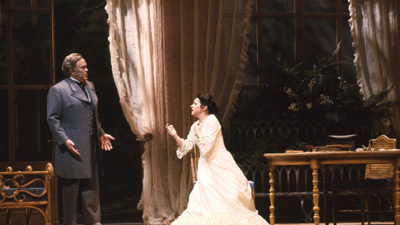 American tenor Michael Fabiano sings with ardent longing as her devoted lover Alfredo, delivering emotionally wrought phrases and ringing top notes. Thomas Hampson brings a burnished baritone to Germont, Alfredo’s protective father whose stern demands spell disaster for the young couple. On the podium, maestro Nicola Luisotti leads an electric performance of Verdi’s unforgettable score.